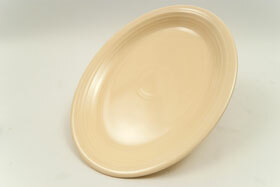 Circa 1937-1951: This Vintage Fiesta platter in original ivory glaze is in excellent condition. 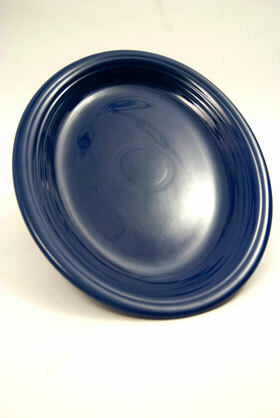 Without chips or cracks or repairs and no sign of use. 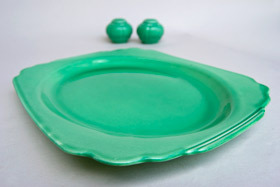 Circa 1937-1952: Like all plates, the platter would have been made upside down with the rings on the backside being hand tooled on the jiggering machine, clay would then dry, be bisque fired, cool for up to days, dipped fully in the luscious HLCo glazes, set on the stilts in the kiln and fired again. 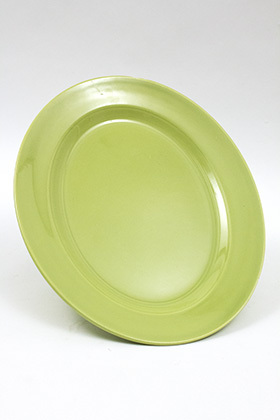 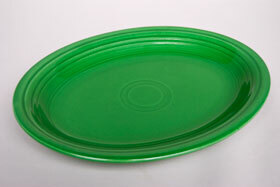 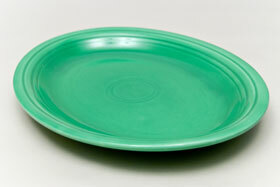 Circa 1951 to 1959: This vintage Fiesta platter in original 50s forest green glaze is in excellent condition. 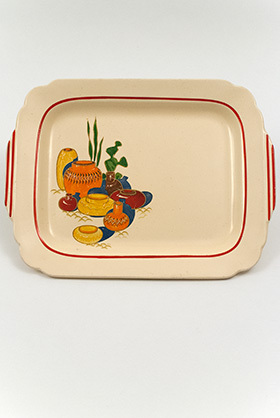 Without chips or cracks or repairs and little to no sign of use. 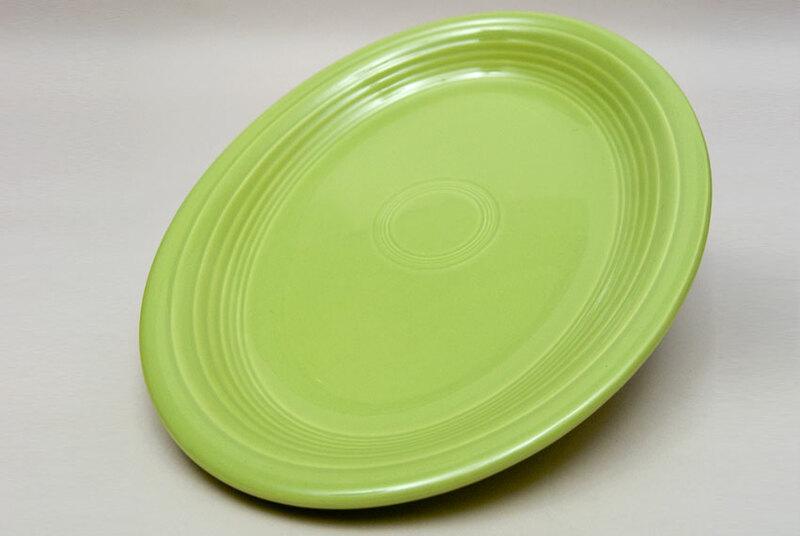 Circa 1951-1959: The 50s vintage gray glaze is a master or disguise, shifting in the light going warm or going cool, it is the chameleon of fiestaware. 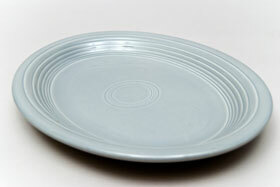 This vintage Fiesta platter in original 50s gray glaze is in excellent condition. 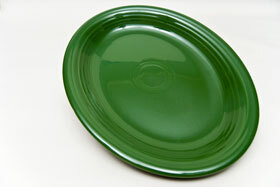 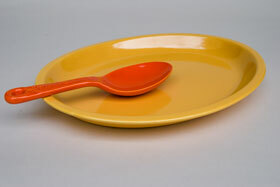 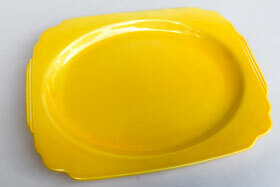 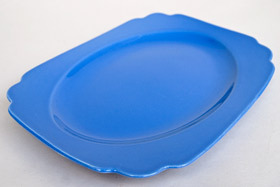 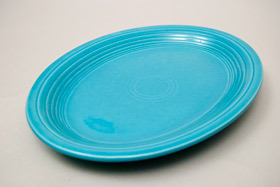 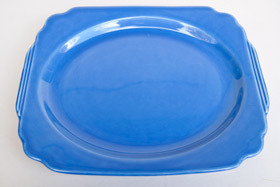 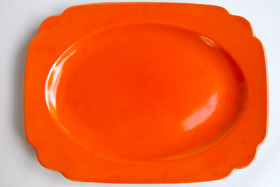 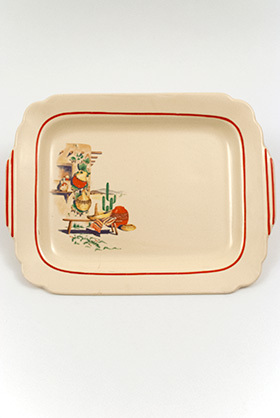 Circa 1951-1959: Theg iesta platter is a great way to showcase your favorite vintage fiesta colors. 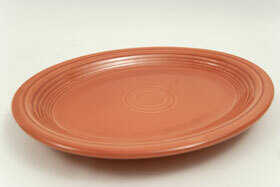 The vintage rose color is wonderfully complex, with subtle hues of browns and much less "pink' than any contemporary color. 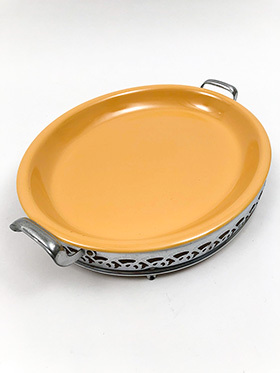 Circa 1938-1944: Modeled in the spring of 1937 for the Royal Metal Manufacturing Co. out of Chicago, the Homer Laughlin Pottery Company's oval platter measures a large 13 1/16" long. 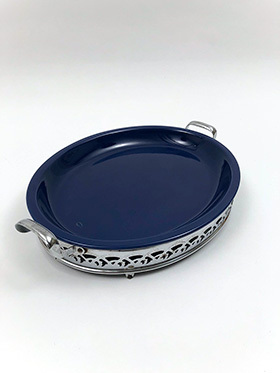 Circa 1937-1944: Large Size—Modeled in the spring of 1937 for the Royal Metal Manufacturing Co. out of Chicago, the Homer Laughlin Pottery Company's oval platter measures a large 13 1/16" long. 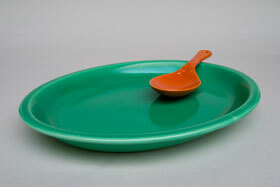 This example includes the original metal holder.